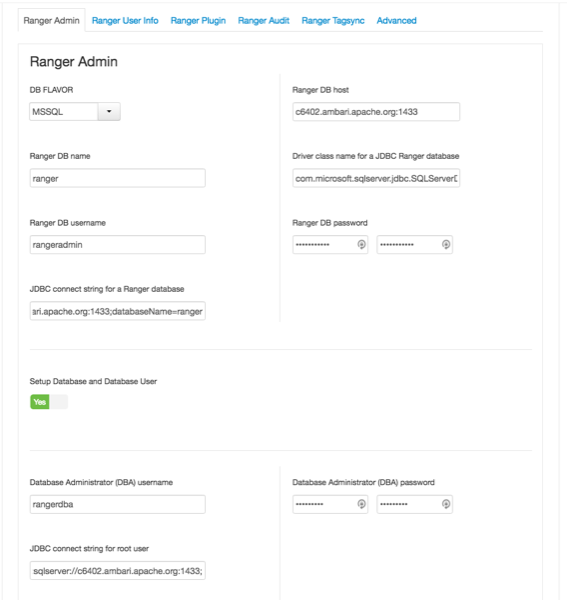 How to customize the Ranger Admin service when installing Ranger via Ambari. 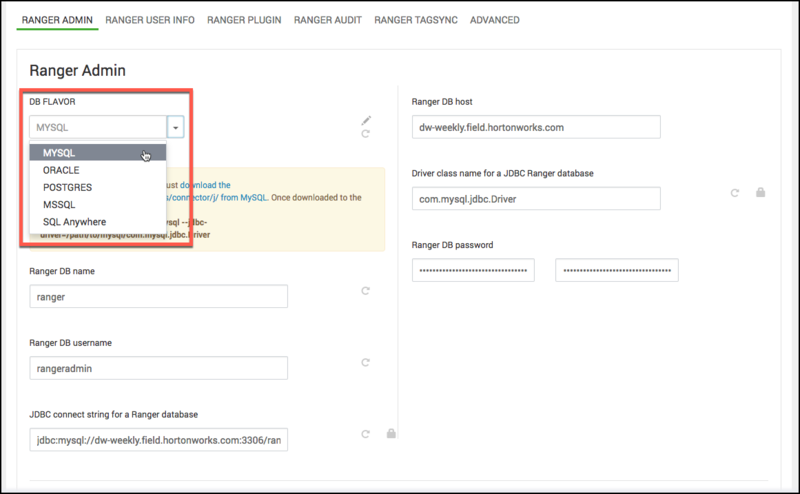 On the Customize Services page, select the Ranger Admin tab, then use the DB Flavor drop-down to select the database type that you are using with Ranger. 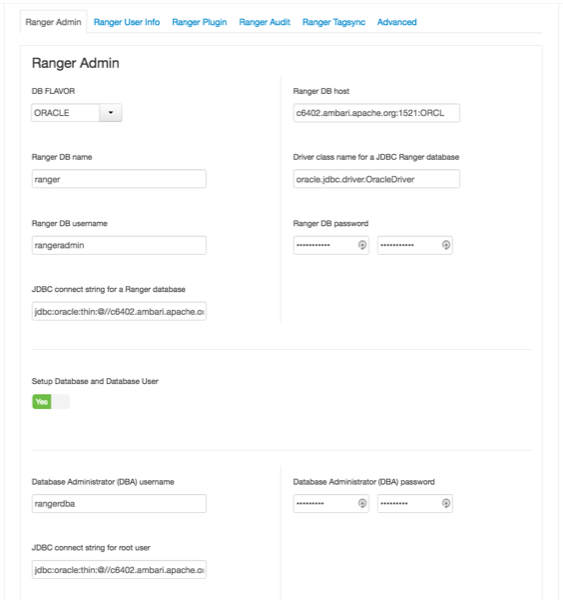 Ranger DB name -- The name of the Ranger Policy database, e.g. ranger_db or ranger. Please note that if you are using Oracle, you must specify the Oracle tablespace name here. Driver class name for a JDBC Ranger database -- the driver class name is automatically generated based on the selected DB Flavor. The table below lists the default driver class settings. 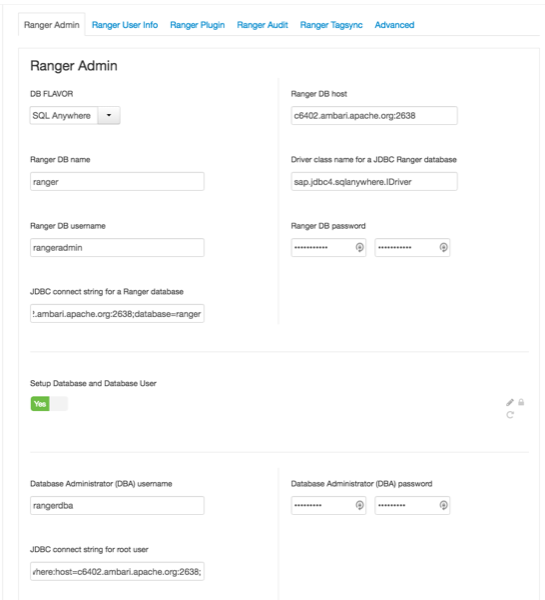 Currently Ranger does not support any third party JDBC driver. 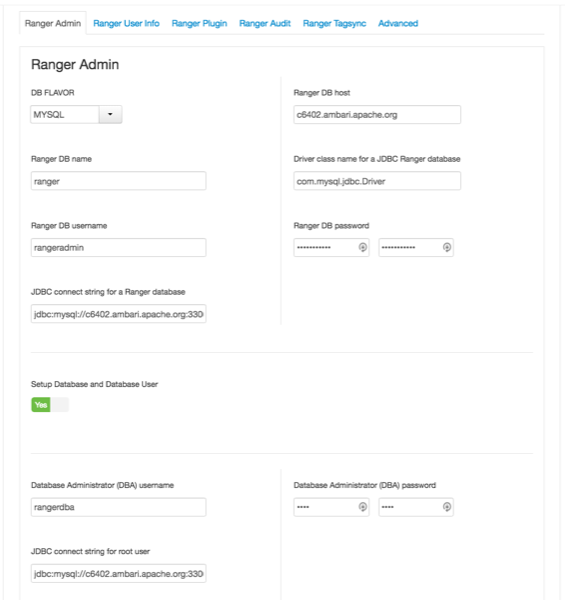 Ranger DB username and Ranger DB Password -- Enter the user name and passwords for your Ranger database server. The following table describes these settings in more detail. You can use the MySQL database that was installed with Ambari, or an external MySQL, Oracle, PostgreSQL, MS SQL or SQL Anywhere database. If set to Yes -- The Database Administrator (DBA) user name and password will need to be provided as described in the next step. 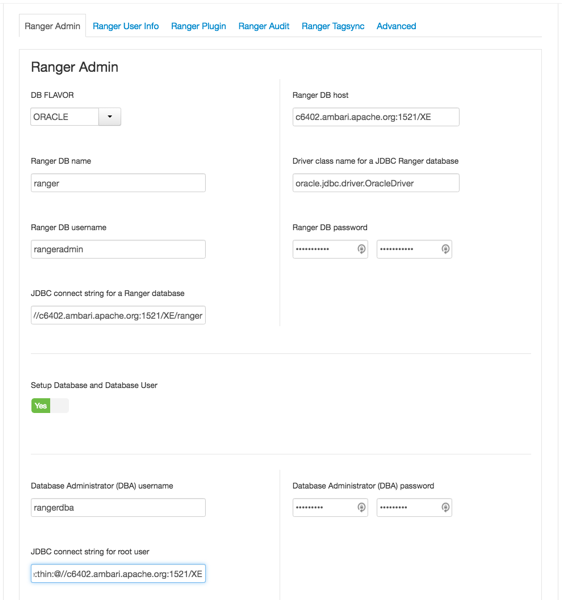 Ranger does not store the DBA user name and password after setup. Therefore, you can clear these values in the Ambari UI after the Ranger setup is complete. If set to No -- A No indicates that you do not wish to provide Database Administrator (DBA) account details to the Ambari Ranger installer. Setting this to No continues the Ranger installation process without providing DBA account details. In this case, you must perform the system database user setup as described in “Set up Database Users Without Sharing DBA Credentials”, and then proceed with the installation. If No is selected and the UI still requires you to enter a user name and password in order to proceed, you can enter any value -- the values do not need to be the actual DBA user name and password. Database Administrator (DBA) username and Database Administrator (DBA) password -- The DBA username and password are set when the database server is installed. If you do not have this information, contact the database administrator who installed the database server. If the Oracle DB root user Role is SYSDBA, you must also specify that in the Database Administrator (DBA) username parameter. For example, if the DBA user name is orcl_root you must specify orcl_root AS SYSDBA. As mentioned in the note in the previous step, if Setup Database and Database User is set to No, a placeholder DBA username and password may still be required in order to continue with the Ranger installation. 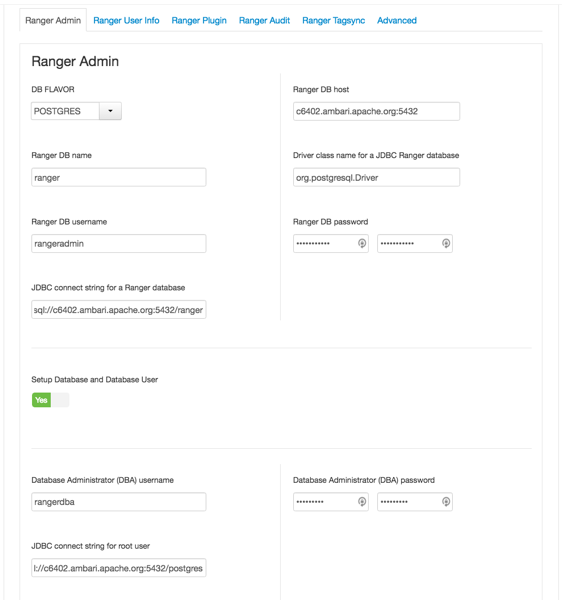 The following images show examples of the DB settings for each Ranger database type. Oracle -- if the Oracle instance is running with a Service name. Oracle -- if the Oracle instance is running with a SID. To test the DB settings, click Test Connection. If a Ranger database has not been pre-installed, Test Connection will fail even for a valid configuration.